Photoshop Fun | Just Jess Fashion! First and foremost HAPPY INDEPENDENCE DAY! 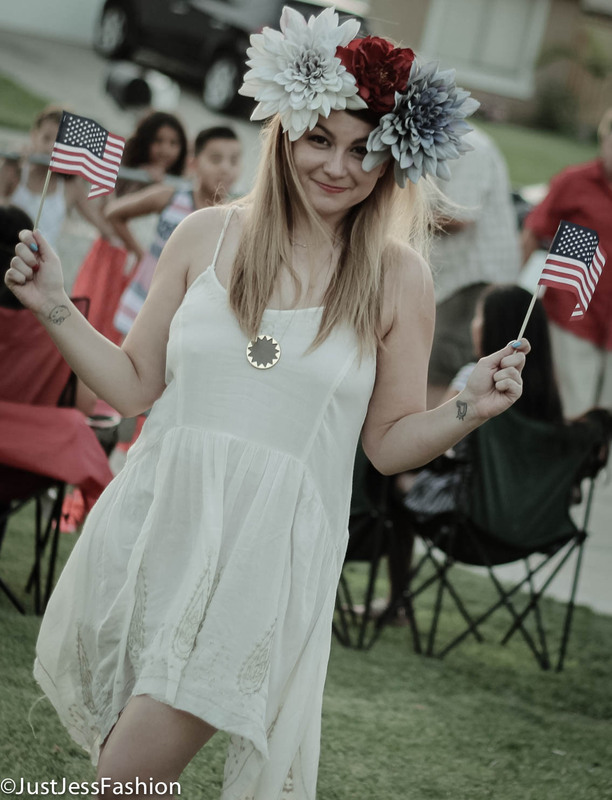 Fourth of July has got to be my favorite holiday. Any holiday in which one could celebrate in color schemes is a favorite of mine (except St. Patrick’s day. I’m not big on corn beef or beer. I choose to wear green any other day.) I seriously have been counting down the days and planning my outfit for the past 2 weeks. My nails are patriotic shades of red, white and blue. And the amazing thing about having an American themed manicure is if it starts to chip away, I have already established a plan b in the form of those fabulous little manicure pens. I can either cover up such blemishes with polka dots or stripes. Genius I know! Although today started off with hours on end of the AMC “Dead White and Blue” marathon (truthfully I’ve been having Walking Dead withdrawals and it was just the thing I needed to hold me over until the Fall.) 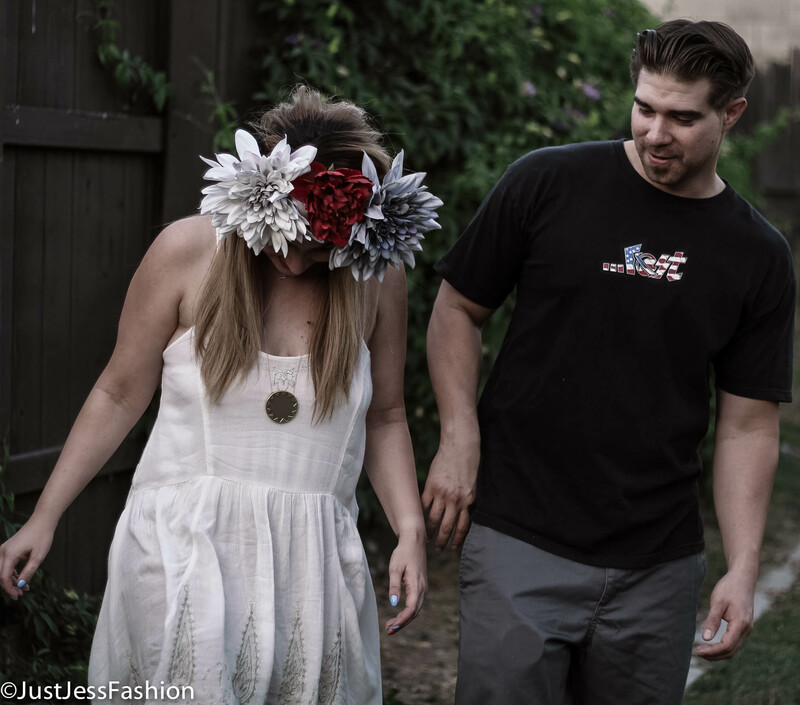 However, I didn’t invest 2 weeks and 30 minutes making a flower crown to lay around with some zombies and my boyfriend. Plus, my family was having a good ol’ fashioned BBQ filled with laughs, good food and hours of fireworks that would make Disneyland proud. I had such a blast catching up and yes even talking style with some of my family members. I’m so proud of them! And I’m so glad to know I’m not the only one who takes this holiday seriously. It’s one thing to be a kid and have your outfit picked out by your fashion savvy parent, but it’s a whole other ball game to be an adult and take proud ownership of this responsibility! 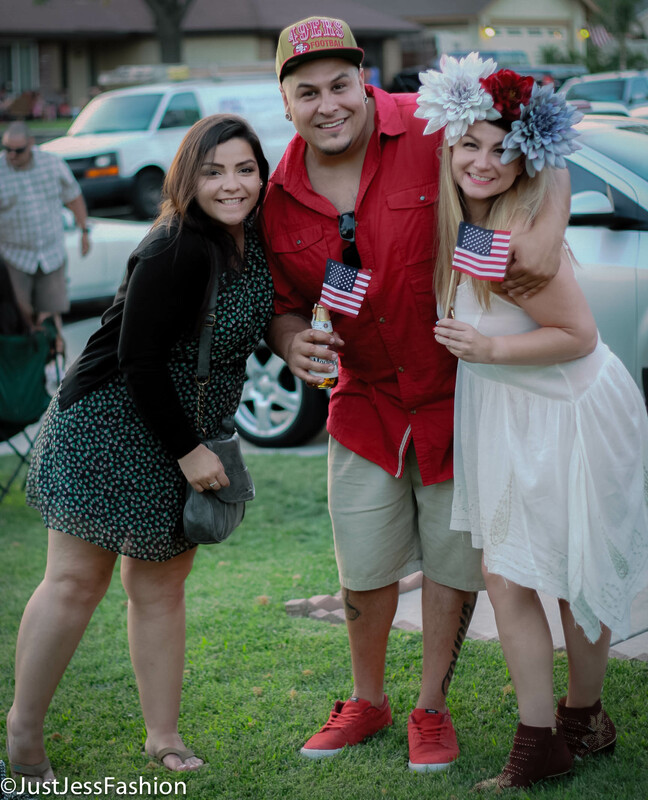 From being decked out in reds, whites and blues, to other party attendees who also believe in the power of a flower crown in patriotic colors. This Fourth of July was one for the books for sure. 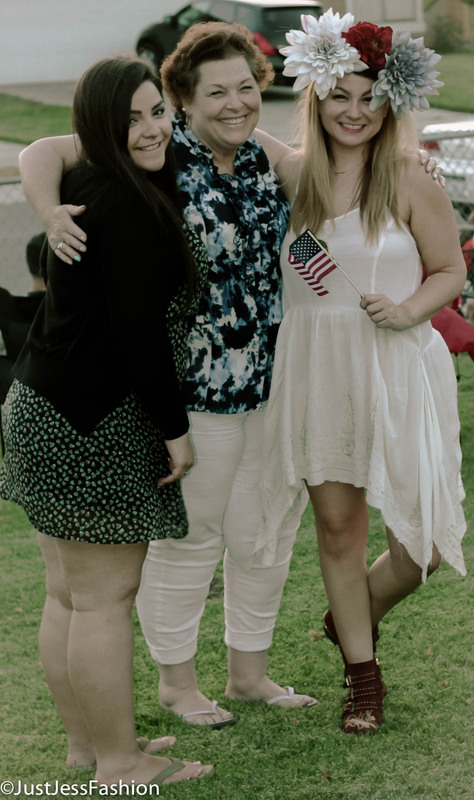 We celebrated being proud Americans, and proud fashionistas. Let the ability to express our freedom through fashion ring! 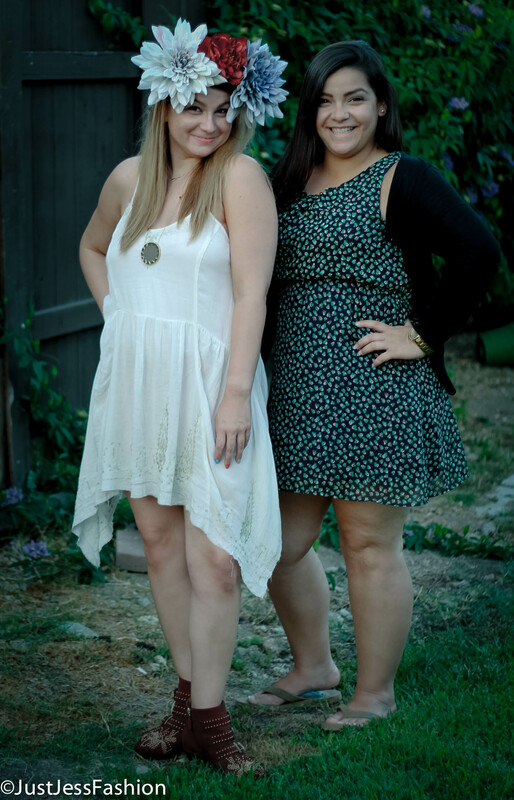 Our style has always been polar opposites! When I was pink, she was blue. When I chose dresses, she chose shorts. Yet as we got older we kinda molded into similar tastes. As much as I miss her I don’t miss the fact that I never have to worry about clothes or accessories going missing! Word to any other siblings who plan to borrow a piece from their sisters wardrobe without asking. If you want to get away with it DON’T PUT IT ON FACEBOOK! 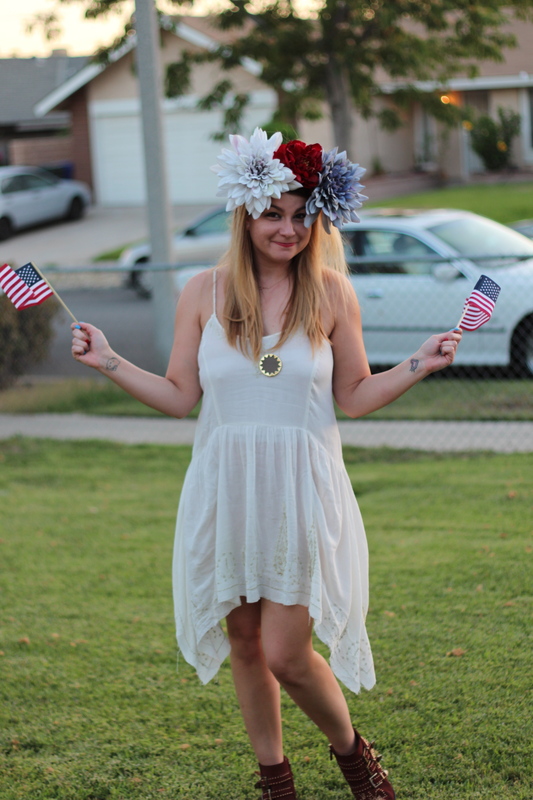 How to make a flower crown (yes, you could buy one from Urban Outfitters, Forever 21 etc. but making one is so much more gratifying.) Step 1: Go to your favorite craft store. I always choose Michaels because of that 40% off 1 item coupon. Step 2: Pick out your floral arrangement. Keep in mind the width of the wires and make sure you have scissors or wire cutters capable of cutting through. Step 3: Before you leave your craft store make sure you pick out something to attach your flowers too. I’ve seen on other blogs people use leather, and ribbons but because I wear it like a headband I opt for elastic to match my hair color. Step 4: Make sure you pick up a glue gun and extra glue sticks to complete the task at home! Step 5: Cut your flowers from your stems and place accordingly on your material of choice. Step 6: Apply glue either on the flower or your material, or both. Step 7: Wait for the glue to dry. As much as you’re going to want to put it one I strongly advise waiting at least 20 minutes to ensure the glue has dried. The last thing you want is flowers permanently attached to your head. Unless thats your thing which if that’s the case send me a message, we should be best friends! Step 7: Try it on, and take a selfie! Share your work of art with the world! PS If none of this made sense to you simply YOUTUBE “how to make a flower crown.” There are a dozen amazing, and easy to follow tutorials. Good luck! Shout out to my cousin Josh who wanted me to point out he has style too! Apparently, fashion is more than a sense it’s a gene too! Ladies and gents meet my number one supporter, my Aunt Jodi! Every time I wear this shirt I’m always going to be reminded of the time my boss spilled a plate of nachos on me. First time wearing it too! And for the record, nacho cheese sauce does come out of silk! So despite popular belief, there is more to fashion blogging than having a fabulous wardrobe. Ugh, I really wish that were all there was too it. Glorified and perfected selfies on a camera phone don’t cut it either. If you want to be taken seriously in the blogging world, an investment in a top notch camera is a must. Then begins the mission of perfecting the use of a high tech camera. Which is a lot harder than it looks. I’ve done the Youtube tutorials. I’ve invested in the books. And I’ve blown up the phone of some of my photography savy friends. Thanks Mike! You’re always a life saver! Even though I’ve grown to love a sharp image. I still like having fun with Photoshop. This image was created using Photoshop Elements. And while I’ve been at this for a little over a year now, I’m just barely starting to get the hang of this thing called photography. Looking back at some of my older posts, I really do cringe. Filters are not always the way to go. Even on an Instagram photo. After finally investing in a 50 mm lens (thanks to my supportive BF) I’ve grown to appreciate a sharp picture. Oh but the mission of photography doesn’t stop there. It took me over a year to get accustomed to the starter lens, and now I start the mission of learning how to work the 50 mm lens. It’s quite simple really with regards to zoom. There is none, and that’s where the only issue exists, especially when you’re at a place like Disneyland and a stranger offers to take pictures of you and your friends. The first thing I have to say is “there is no zoom” and despite this disclaimer everyone still looks for the zoom button. Contrary to what a veteran photographer told me, this lens really is amazing. A few months back I went and had a chat with a guy who owns a photography shop and he explained that this lens was cheap and not worth the $100 price point. He explained that the purpose of the lens was to pronounce the subject with pristine focus and then blur the background. Something one could argue could be accomplished with even the most basic photoshop tools. However, the focus on this thing does not compare to even the best photoshopping tool. So far I’ve only had a few issues with the lens. First it’s super loud and can sometimes take a while to focus. I highly recommend shooting in manual to achieve the most desired outcome. Another issue I discovered today with this lens was it’s hard to focus on a tripod when doing a photo shoot solo. I’m sure there’s a technique to mastering this that I just haven’t’ discovered yet. In the meantime I think I might just utilize the age old tradition of trial and error and invest in a marker to mark the focused spot. One of my co-workers introduced me to the term “vegan leather” to what I formerly called “faux leather.” I think we can all agree using “vegan” as opposed to “faux” has a more positive connotation, and even sounds animal friendly.